4141 W. Twelve Mile Rd. Thinking of buying a new bicycle or hockey equipment? It can definitely be a challenge because there are all kinds of options out there, from huge department stores to a gazillion online options. Where you buy has everything to do with what you get. 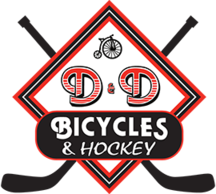 D&D is staffed with professionals who love what they do – and love getting you into the right bike or equipment that fits you perfectly. We will provide you with a true quality product and the best service you can find.